I started a post last week about my recent field trip to the Arctic – I was situated in Cambridge Bay (Nunavut) for a week, and here are a few more reflections from that trip. Walking across the tundra brings sights of circling rough-legged hawks and the sounds of jaegers. 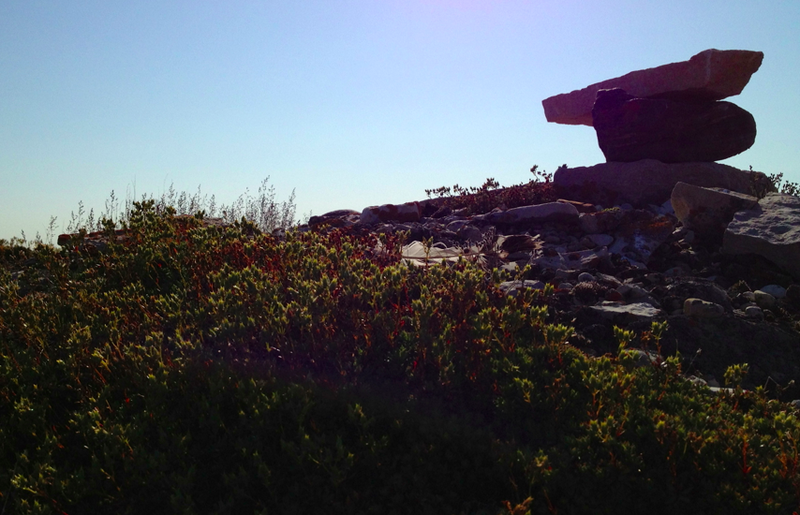 We were able to find spots where the hawks like to sit (at higher elevations, on a pile of rocks and boulders). The vegetation is particularly rich under these perches, as the nutrient inputs are very high! We could also find feathers, and pellets – these pellets are a tidy package – a mass that represents the undigested parts of a bird’s food, regurgitated. These pellets can be dissected and you can find the tiny bones of small mammals. While in Cambridge Bay it was a particularly good year for lemmings, and thus a particularly good year for hawks, and snowy owls. Each day on the tundra, about a dozen different snowy owls were sighted. They were always just the right distance away, perched beautifully and peacefully on slight rise – a close look with the binoculars showed the owls staring right back, tracking our movements as we were tracking theirs. If you walk little closer, the owls take off, flying low and fast over the tundra. Bird food. 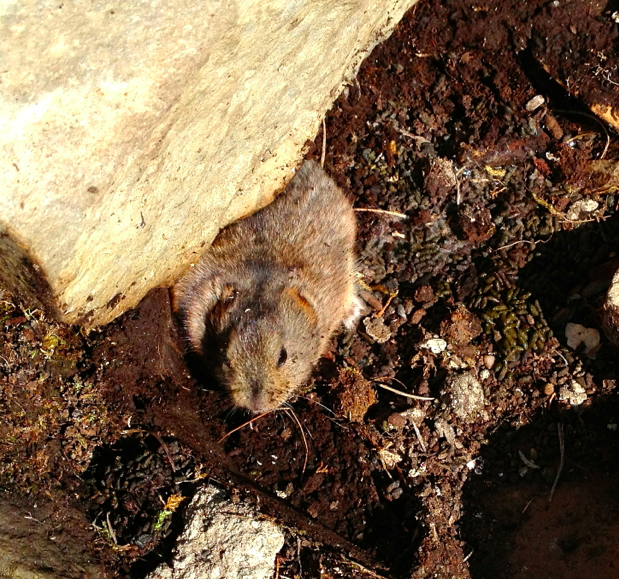 (otherwise known as lemming). At times, off in the distance, it was also possible to see black, slow-moving shapes – unusual creatures, shaggy, and foreign to a boy from the south. These were muskoxen – chewing their way across the tundra. While in Cambridge Bay I spent some time with graduate students working on Muskox health, and I learned of the serious disease, lungworm, that is affecting these stunning mammals. Lungworm has been known from the mainland for some time, but only more recently on Victoria Island – climate change is a possible reason for this change in distribution. These nematodes use slugs or snails as intermediate hosts. Yes, there are slugs and snails in the Arctic! Finally, it’s pretty difficult to talk about Cambridge Bay without mentioning the fish. The traditional name for this place, in Inuinnaqtun, is “good fishing place“, and that is an apt description. We ate fresh fish every day, enjoying Lake trout, Greenland cod, and the most delicious of all, Arctic Char. We were blessed with amazing weather during my week in Cambridge Bay, and our Sunday afternoon fishing trip on the ocean was picture-perfect. The landscape is breathtaking in its starkness. The tundra rolls out like a grey/green/brown carpet, as far as the eye can see. It’s broken up by ponds, streams, and lakes, and broken up by slight changes in elevation. This results in a landscape that ripples with shadows and colours; a landscape that meanders, curls and curves depending on the underlying bedrock, sediment, glacial till, and permafrost. At first glance, the Arctic tundra appears homogenous, but after walking for hours upon hummocks and through cotton grass, you start to see the diversity of ecosystems, and the heterogeneity in microhabitats. It’s a landscape that is forever changing and providing plants and animals opportunities as well as challenges. 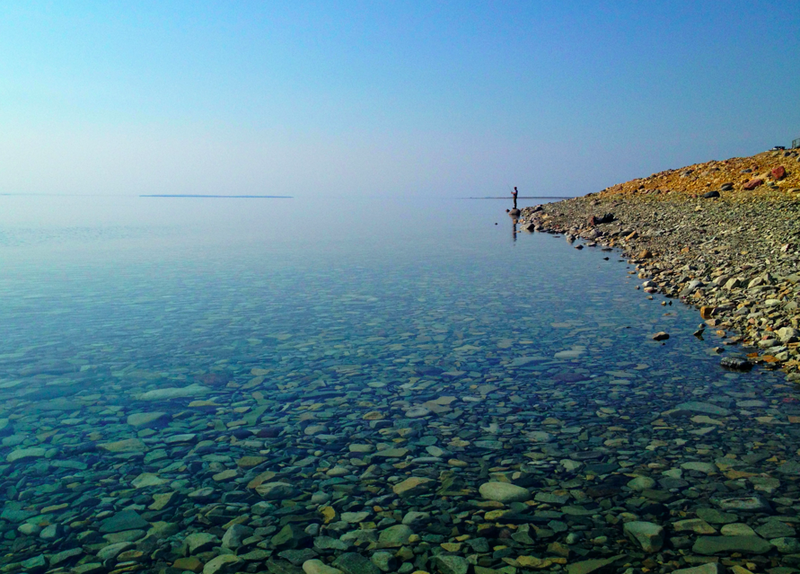 I was in Cambridge Bay in early August, and it was evident that the summer season was ending. In addition to the signs from the plants (lack of flowers) and wildlife (geese were moving in, in flocks; butterflies were seldom seen), the strongest evidence was the light. During the week I was in Cambridge Bay, there was about 18 hours of daylight each day, but the land is losing about 5 minutes of light each day – it’s a rapid change. Since Cambridge Bay is above the Arctic circle, it gets 24 hours light in June and early July, but by mid-August, summer is winding down. This means, however, that you can experience the most stunning sunsets – you can sit for hours and watch the sun approach the horizon from a remarkably shallow angle. The “magic” light is with you for hours. The kind of low light that makes everything slow down. The kind of light that creates long, dancing shadows, and warms everything in a soft, gentle glow. To finish, I wanted to write a little bit about perspective. The Arctic makes you feel close to the earth. When standing on the tundra, the land before you contains no telephone lines, roads or apartment buildings. It’s very much like it was hundreds or thousands of years ago. You could start walking and you won’t likely see anyone else. The Arctic causes you to reflect and slow down. And most importantly, the Arctic makes you feel small. I think that’s an important feeling to have every now and then. The land is vast and old; we are small and young. Let’s remember we are here for a short while, and some of our time is probably well spent out in a forest, on a lake, or hiking the tundra. Time on the land is time well spent, in part because it causes you to pause and reflect. I think the world would be a better place if we spent a little more time breathing in nature, and remembering what the earth is giving us and on how we ought to respect it a little more. We owe it everything. The Arctic makes me think of these things and for that I am grateful. It sounds very much like how I feel when visiting the prairies – particularly Grasslands National Park, where you can be alone with the wind and there is hardly a sign or sound of civilization. Very nice Chris. I bet it is even better as winter transitions into summer. At high latitudes (I grew up at 65.5 degrees north in Sweden), spring is a brief intense experience. Everything explodes to life in rapid motion as if every organism realises that summer is short. The nights are long and you seem to not need sleep. When I immigrated to Canada, the one thing I was homesick for was the intensity of the northern Swedish spring. I have never been to the true arctic, but I understand completely! Nice article! I just got back from a canoe trip on the Nahanni River in the NWT. The North is a spectacular place, and as I’m just beginning to discover, has some really fascinating stories of evolutionary history. Check out this blog post I did on camels on Ellesmere Island if you’re interested! Thanks for the comment, Sarah! And for the link – fascinating… I will read with interest.